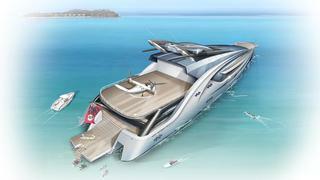 Winch Design has revealed a new 100 metre trimaran concept that, if built, would be capable of accommodating a plane. Some of the world's largest yachts have space for one or even two helicopters to land as well as hangars to store them in, but this design from the renowned London-based designer is large enough to accommodate a landing deck for an Agusta Westland 609 Tiltrotor aircraft. This impressive feat is made possible by the wide 21 metre beam of the yacht. With the superstructure spread out over three hulls the yacht also has space for a hangar to store the aircraft, as well as large tender garages and interior spaces. The trimaran design does not only mean there is more space, but it is also more efficient than a monohull. 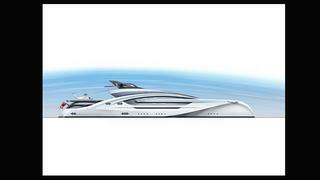 The yacht is estimated to reach a top speed of 26 to 28 knots using fairly standard diesel engines. This impressive speed would not be possible if the same engines were used in a similarly sized monohull. The AW609 Tiltrotor aircraft combines the attributes of fixed wing and rotary wing aircraft to enjoy the best of both worlds. The aircraft takes off and lands vertically but also has a pressurized cabin, as well as greater speed and a further range than a typical helicopter. Flying above the weather, the AW609 can travel 700 nautical miles with up to nine passengers sitting in comfort. Winch Design was founded in 1986 by superyacht designer Andrew Winch and is responsible for many notable custom yacht projects such as Al Mirqab, Madame Gu and Inoui. Winch Design works with several superyacht yards to create new concepts, including on the recent Dart 80 concept with Royal Huisman.